Blend lots of blue fabrics to piece an intriguing pattern made with Square-in-a-Square and Framed Square blocks. 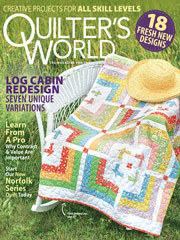 This e-pattern was originally published in Weekend Scrap Quilting. Size: 78" x 90". Block Size: 12" x 12".